This is my entry for Is My Blog Burning #23, hosted by Cucina Testa Rossa. The theme is Vive La France. I cogitated over this for a while, but settled on something extremely simple to make, figuring that the other entries might go more elaborate. 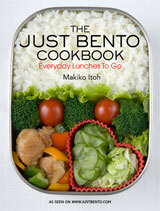 I'm also a bit cooked-out at the moment due to the Masterchef cooking! But anyway...onwards we go. The picture above is a little misleading. The star of the show is not the golden brown crêpes. It's the unprepossessing little bowl of white sauce. This is a Provençal staple called brandade de morue. It hasn't become as trendy around the world as other delicious sauces from this much lauded region such as tapenade or pistou, but is, in my opinion, one of the most delicious tastes in the world. It's possible that brandade de morue is not as renowned because its star ingredient is salt cod. Any seafaring culture has a tradition of heavily salted fish, and since cod has always been a popular fish, there are variation of salted cod everywhere: Italy, Spain, Portugal, Greece, and of course France. Marseilles was at one point the major salt cod manufacturing point for the whole of Europe, and it still produces a lot of it. Salted fish does not really fit well into our modern lifestyle, since it needs an extended period of soaking. I love the taste of it though, coming from a culture (Japanese) that has always relied on salting and drying to preserve seafood. I also love the slowness of it: soaking the fish overnight, planning ahead for the meal that it will be the basis of. It's an entirely different experience from popping a frozen dinner tray into the microwave. Making a brandade is so easy with our modern food processors and mixers, it's almost not a recipe. The one key to it is to soak the fish in cold water beforehand for at least 24 hours, changing the water several times, to reconstitute the cod and to remove much of its salt. You should also use a good, fruity olive oil, preferably from Provence (but any good extra virgin olive oil will do). A brandade can be used for any number of things: as a dipping sauce for raw or steamed vegetables; on crusty bread; even as an interesting pasta sauce. Here I have used it as a stuffing for crepes. This isn't very traditionally Provençal I admit, but the very first time I had brandade was in a creperie in the small, charming town of Grillon, in the northern part of Provence. 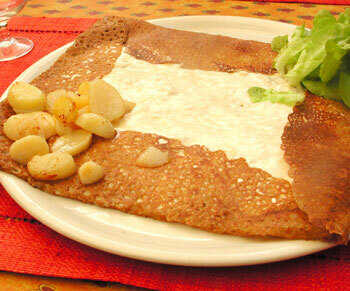 It was simply spread onto a large, crispy Galette Bretonnière (a buckwheat crêpe from Brittany) which was folded over at the edges, the dark brown lacy edges framing the white sauce so inticingly. One mouthful, and I was a brandade convert for life. It is salty, just slightly fishy (but in a good way, like the freshest anchovies, but less so), garlicky, and full of fruity olive oil flavor, with the slight acidic edge provided by the creme fraiche, that elevates it to the highest level of taste. 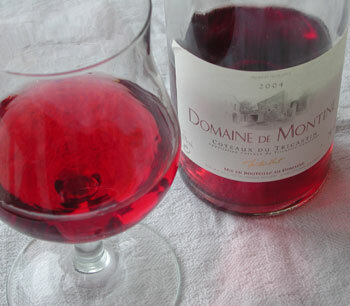 As for a wine to accompany a meal with brandade, why not a rosé? There are many rosés in Provence; light and refreshing, to cut through the sometimes intense flavors of the food of the region. Nothing is quite as evocative of summer as a chilled glass of rosé and a meal redolent of olive oil and garlic. The one we had on hand is Domaine de Montine, from the Tricastin region, which is near Montélimar, the self-proclaimed nougat capital in the northwestern corner of Provence. This area is not nearly as touristy as southern Provence, but I almost prefer it over the more famous areas near Arles or Aix or Marseilles. 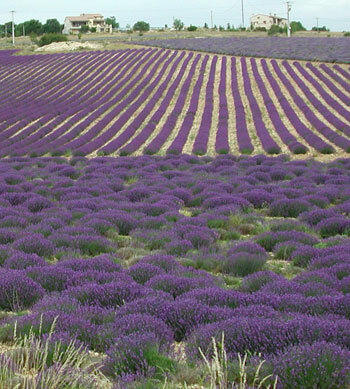 If you want to see the Provence cliché of lavender fields stretching out as far as the eye can see, go to the north. Soak the salt cod in cold water, changing the water several times, for at least 24 hours beforehand. Gently poach the drained cod in water to cover for about 10-15 minutes. Take out the cod, let it cool and take off the skin if there is a skin. Carefully go over it and pick out any bones. Roughly flake the cod into the bowl of a food processor or mixer, with the garlic cloves. Pulse to chop it up, then add the olive oil and creme fraiche. Puree intil smooth. The consistency should be that of thick mayonnaise. Add a little more olive oil if necessary. This makes about 2 cups. Store any left over sauce well covered in the refrigerator, and use up within a few days. For the crêpes, please refer to this recipe for a good all-around version. Submitted by maki on 2006-02-26 22:33. 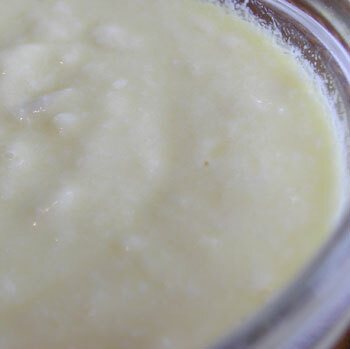 I've got a little container of salt cod in my fridge just waiting to be made into a brandade of sorts. I admit my version is rather bastardized - I mash up leftover baked potatoes into smallish chunks to mix with the cod, heavy on the garlic, then scoop that onto precooked artichoke hearts. Run it under the broiler for a golden top if you like. 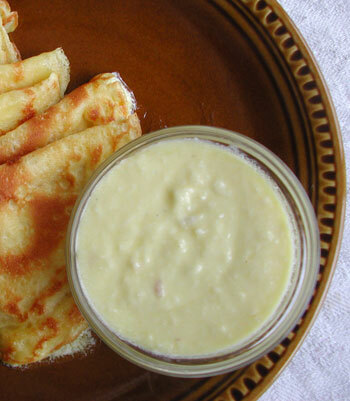 It makes a tasty and surprisingly non-trad tapas or snack with a glass of wine.